Be the first to hear about their new releases and deals. Download the Booksprout app and search for K.J. McPike today! K.J. McPike is the USA Today bestselling author of The Souls Untethered Saga. 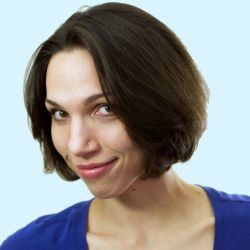 Her debut novel, XODUS (later retitled Souls Untethered), has won multiple awards, including First Place Category wins in both the 2015 Paranormal Awards and the 2016 Dante Rossetti Awards for Young Adult Fiction, a category medal in the 2016 New Apple Summer Ebook Awards, and silver medals in both the 2016 Readers' Favorite International Book Awards and the 2016 Wishing Shelf Independent Book Awards. After growing up in rural Virginia, K.J. embraced the nomad life and has since lived in Spain, Thailand, Mexico, Indonesia, and Vietnam, as well as all over the United States. Her travels have also taken her to places like Argentina, Turkey, Portugal, England, Italy, and Ireland, and she is actively adding more to the list. No matter where she is around the globe, she is likely consuming too much caffeine and spending more time in coffee shops than her own apartment. Keep up with K.J. 's books and her nomadic ways online at www.kjmcpike.com or through Instagram and Twitter at @kj_mcpike.